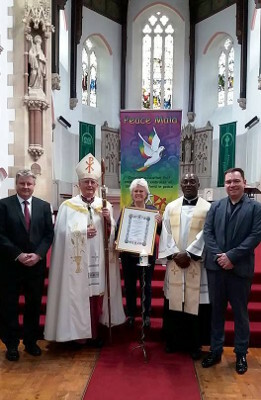 On September 21st 2017, Peace Mala celebrated the UN International Day of Peace at St Joseph’s Catholic Cathedral in Swansea Wales UK. 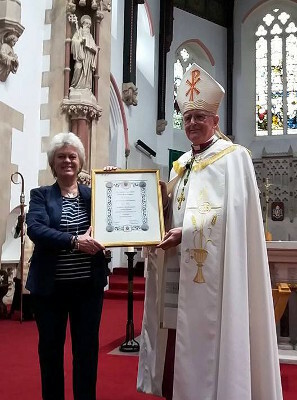 This was thanks to the kind invitation of Bishop Tom Burns of Menevia and the wonderful support of the Dean, Rev. Fr. Benedict Koledoye. Seven schools attended and took part in the Peace Mala Youth Liturgy for World Peace and sang their hearts out. We linked up with One Day one Choir, an inspiring global peace initiative which uses the harmonious power of singing together to unite people around the world on Peace Day. Peace Mala schools that could not be with us sang the Peace Mala Anthem, ‘One Light’ in their school assemblies across the UK. Lee Michael Walton, composer of the anthem, drove from London and back to accompany the children’s singing on St Joseph’s Cathedral organ. When it came to the final prayer and blessing from Bishop Tom, he announced to all present that he had tried to persuade a very special guest to attend, but that this person was too busy to be with us. He had, however, sent us a special message. 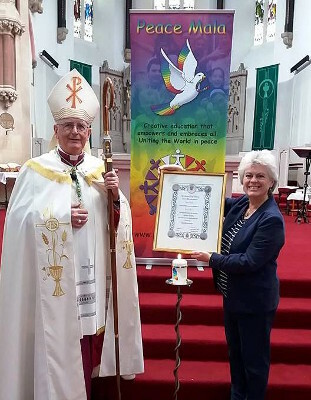 Imagine the surprise when Bishop Tom went on to read the following message from an official document in a large gold frame. 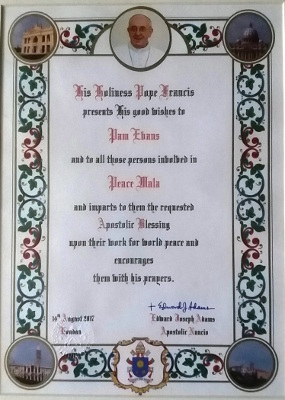 This message and blessing which has a seal signed by the Apostolic Nuncio, is now on the office wall of Peace Mala HQ in Swansea, near the visitors book. Pope Francis (born Jorge Mario Bergoglio 17 December 1936) is the 266th and current Pope of the Roman Catholic Church, a title he holds ex officio as Bishop of Rome, and sovereign of Vatican City. He chose Francis as his papal name in honour of Saint Francis of Assisi. Born in Buenos Aires, Argentina, Bergoglio worked briefly as a chemical technologist and nightclub bouncer before beginning seminary studies. He was ordained a Catholic priest in 1969, and from 1973 to 1979 was Argentina’s provincial superior of the Society of Jesus (Jesuits). He became the Archbishop of Buenos Aires in 1998 and was created a cardinal in 2001 by Pope John Paul II. He led the Argentine Church during the December 2001 riots in Argentina, and the administrations of Néstor Kirchner and Cristina Fernández de Kirchner considered him a political rival. Following the resignation of Pope Benedict XVI on 28 February 2013, a papal conclave elected Bergoglio as his successor on 13 March. Throughout his public life, Pope Francis has been noted for his humility, emphasis on God’s mercy, concern for the poor and commitment to interfaith dialogue. He is credited with having a less formal approach to the papacy than his predecessors, for instance choosing to reside in the Domus Sanctae Marthae guesthouse rather than in the papal apartments of the Apostolic Palace used by his predecessors. In addition, due to both his Jesuit and Ignatian aesthetic, he is known for favouring simpler vestments void of ornamentation, including refusing the traditional papal mozzetta cape upon his election, choosing silver instead of gold for his piscatory ring, and keeping the same pectoral cross he had as cardinal. He maintains that the church should be more open and welcoming. He does not support unbridled capitalism, Marxism, or Marxist versions of liberation theology. Francis maintains the traditional views of the church regarding social teaching, ordination of women, and clerical celibacy. He opposes consumerism, irresponsible development, and supports taking action on climate change, a focus of his papacy with the promulgation of Laudato si’. In international diplomacy, he helped to restore full diplomatic relations between the United States and Cuba.